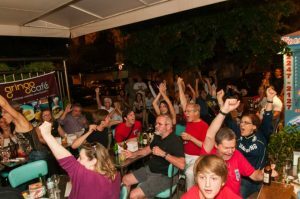 RIO DE JANEIRO, BRAZIL — During the World Cup matches with England and USA playing, The Rio Times is hosting a series of special Rio World Cup MixUp events, bringing fans together to watch the matches at the Gringo Café in Ipanema. Today’s (June 19th) match with England playing against Uruguay will kick off at 4PM on a large screen with drink promotions, food specials and a DJ for before and after the matches. England fans cheer on the Three Lions in their first Group Game match against Italy last Saturday, photo by Vito Photography. For an international crowd of local expatriates and Brazilian fans and guests, The Rio World Cup MixUp will be co-hosted by the British and Commonwealth Society of Rio de Janeiro (BCS), British Chamber of Commerce (BritCham) and with support from the UK Consulate in Rio. Also co-hosting is the U.S. Consulate General and the American Society of Rio de Janeiro (AmSoc Rio). A special contest will go on throughout each game with one of the sponsors, Gilson Martins, giving away a World Cup themed bag from their newest collection “Sou+Brasil.” Contest details will be available on site. Other sponsors include Gloria Erthal Bio-Jewelry, Cachaça Magnífica and Budweiser. The entrance is free and has special discounts on beers at R$5 long necks and R$10 caipirinhas during the match. Due to heavy turnout, reservations are suggested for VIP table seating, call asap: (21) 98194-0631.